Alternator means alternating generator. 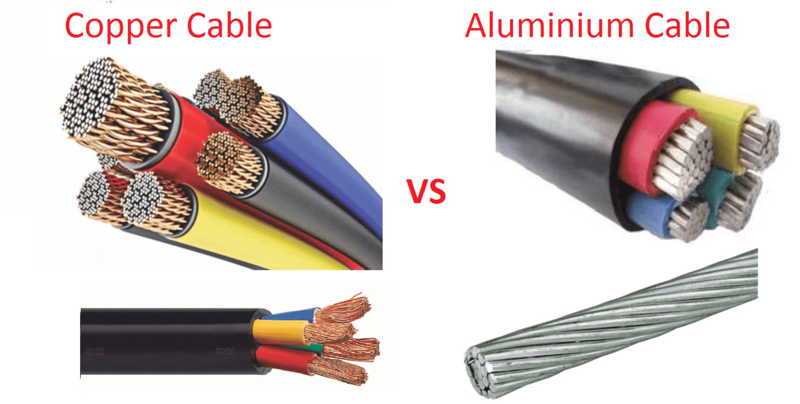 Which converts mechanical energy into electrical energy. Core of the power plant is alternator and turbine. 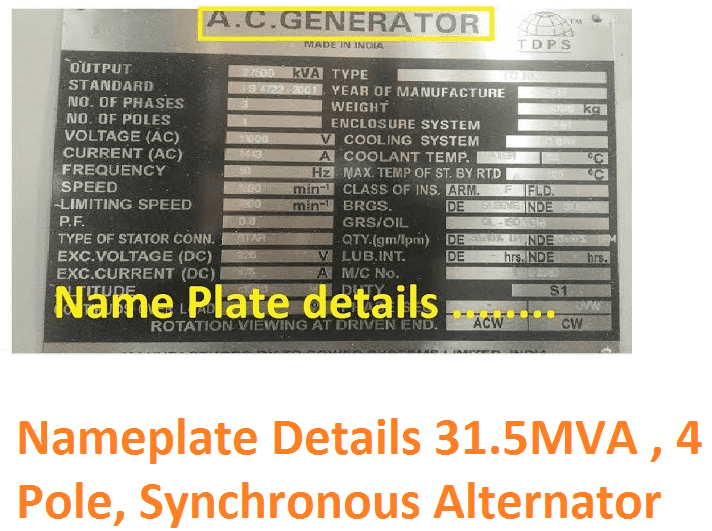 In this, we are going to see, how to read alternator nameplate details easily. It means the original equipment manufacturer is TDPS. These details are used to contact the material manufacturer for technical discussion, spare procurement, maintenance etc. This is output power of the alternator. The maximum full load capacity of the alternator. Three phase => the output phase of the alternator. 4, Number of magnetic pole used to design the alternator. The number of poles specify the size of the alternator. If the number of poles are increased then, the alternator’s dimensions also has to be increased. Why alternator size increases as the number of poles increases? If the number of pole of the alternator increases, then, the size should be increased because of the synchronous speed of the alternator will get decrease Ns=120f/P. Hence the cooling process of an alternator get decreased. To match, this we need to increase the surface area of the alternator. The rated output voltage of an alternator. Here the output voltage is 11000 Volts. The rated output current of an alternator. Here the output current is 1443 Amps. This is the safe operational load of alternator. Beyond that limits are not permitted. All the Protection Relays are designed to operate above 1443 ++ Amps. The unit rpm means revolutions per minutes. The rotor or the prime over rotates 1500 rpm per minutes. To be in synchronization, the speed of the alternator should be same. The speed generally controlled by electromechanically build speed governor system. The speed should be monitor continuously. Changes in the speed may lead to trip of the alternator in under voltage, over fluxing or over voltage relay operation. The rated power factor of the machine. But this power factor can be modified by using AVR or transformer tappings. This is winding connection of the alternator. The winding connection can be either star or delta. But 98% of the alternator is preferred to winding in star connection. As the Star winding generator has many advantage over delta connected generator. The output of the RRA to the rotor coil. RRA => Rotating Rectifier assembly. The input DC voltage to the rotor coil from RRA. Note: These voltage is controlled by the Automatic voltage Control System (AVR) and the control has done through excitation generator. The type of enclosure used to protect the alternator from physical substances. And the type of cooling system used in alternator such as Water cooling, self-air cooling, forced air cooling. if your alternator is air cooled, then it means the air inlet temperature. If you use water instead of air, it means water inlet temperature of the cooling tubes. The maximum temperature that the stator insulation can withstand. It is purely depending upon the insulation used in the winding coil. Some international derived insulation standard is there. If F class insulation means the insulation can withstand upto 155 deg temperature for both stator and rotor coil. The type of bearings are used…such as ball bearing or roller bearing or thrust bearing or sleeve bearing etc.. Which means the type of oil should be used to cool the alternator bearings. S1 means, we can run the machine 24 X 7 throughout the year. Previous articleWhy PT burden is high Compare with CT burden?